A dedicated workgroup printer, the Konica Minolta Magicolor 3730DN allows excellent productivity with its fast print rates and high-volume duty capacities. The series even offers upgradeable features, which all come standard with the Konica Minolta Magicolor 3730DN, including duplex capabilities and network setup, which make this device the ultimate workgroup tool. Even toner cartridges can be purchased at good value and with a 5,000 page capacity, users won't have to replace toners frequently, saving money on print costs. However, the Magicolor 3730DN printer can only do one function, and will not meet the needs of offices that require a compact, all-in-one device. The Konica Minolta Magicolor 3730DN laser printer is more petite and compact than most laser printers. 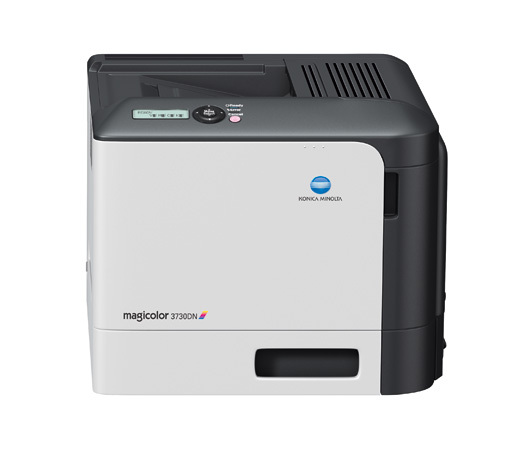 The Magicolor 3730DN network laser printer features built-in duplexing and networking, which adds to its reliability as a workgroup printer. It uses individual toner cartridges for each colour, and is designed for a maximum monthly duty cycle of 120,000 impressions. The Konica Minolta 3730DN printer boasts many environmentally friendly features like its economy and duplex modes. In addition to its biomass toners, which significantly reduce environmental impact, the Konica Minolta Magicolor 3730DN colour printer also takes pride in its fast print speeds and exceptional print quality. Colour and black and white prints are rated at 24 ppm, which ultimately increases productivity. High capacity Magicolor 3730DN laser toners are produced for this model to maximise productivity and minimise output costs. The Konica Minolta Magicolor 3730DN colour laser printer, however, is not a multifunction device, which means offices in need of integrated fax, copy, or scan features will have to look elsewhere.